Architecture can’t exist on a page it must be built. Transforming drawings and tiny cardboard models into physical reality means choosing materials to represent our ideas. In part four of the architecture short course I discuss materials – how architects choose them, how we know what’s right, how they can shape how we feel in a space, how they influence our designs, and a rubric you can use when selecting your own. Instead of an abstract exercise, I walk through the precise process I used to choose the materials for the case study project we’ve been following throughout the course. Links to all my favorite material resources. As transition elements, decks can engage the site in a way the house can't. If they're freestanding and not connected to the house (which I recommend whenever possible) they can be set at almost any height without the same concerns one has with setting the building floor too low. Keeping decks as separate elements has the added benefit of not puncturing holes in the siding or foundation or all the worry of flashing details. Generally, I prefer to keep decks as simple as possible: regular, rectangular forms, no chamfered corners or multi-level every-trick-in-the-bag affairs. Regularized, rectangular forms accommodate seating groups well and they make economical use of framing materials. The key to integrating your deck into the architecture of your home is to reference the interior and exterior spaces with the geometry of the deck. Try to wrap these elements around a building corner which engages the architecture and feels deliberate. Try to connect interior and exterior floor planes with decks, generally large glazed exterior walls are natural locations to connect interior and exterior spaces. My advice with any design element is to make the gesture large, singular and with purpose. Note how the Pond House deck is a long singular gesture, almost wharf-like. It follows the geometry of the house, wraps the corner and connects the interior and exterior spaces. It transitions from land to water and while it's more than 30" above the adjacent topography the cable rail guard virtually disappears. PT, the colloquial term, is made from Southern Yellow Pine and is soaked in chemicals under pressure to preserve it, this lends a green tint to the fresh wood, which over time weathers to a muddy brown. The chemical formulations used to treat wood have changed over time as manufacturers discover which ones are carcinogens and choose a new 'greener' formula. Beyond the toxic nature of the preservatives in PT wood, pine is generally considererd dimensionally unstable and is prone to warping and cracking...doesn't sound great if it's a surface you or your children will walk on with bare feet, right? Many people choose PT wood because it's inexpensive and readily available in all of the big box stores, but I would urge you, if you're able, to steer away from this as an option even if it means making your deck smaller and use one of the following materials. These woods are naturally rot and decay resistant, their resins and tannins protect them even without finish and they weather to a soft, silvery gray if left untreated (which I recommend). These woods have the added benefit of being easy to cut and fasten, they're lightweight and they look very tailored. Because they're softwoods they will dent and scratch with time but equally they're soft underfoot. Typically these woods are graded by appearance, clearer grades being more expensive. Buy the best grade you can afford, and each lumberyard has different terminology related to each grade. Do be afraid to ask and look at their stock, they're there to help. A vertical grain board will be more dimensionally stable and look better than a plainsawn board. 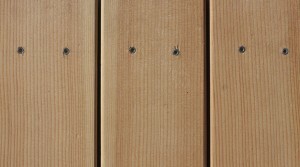 The Western Red Cedar Association has an excellent guide to selecting cedar for decking, you can find it here. Here at 30X40 Design Workshop I try to use local products whenever possible. Local is generally accepted to mean any location within 500 miles, which ensures that the product has low embodied energy (the total energy cost associated with getting the product to market) and doesn't negate the 'green' aspect of choosing a natural product in the first place. The local products I have access to are Eastern White Cedar STK 1x6 decking and Atlantic White Cedar decking. The Eastern White Cedars are known for being knotty but the STK grade assures you receive only small tight knots. This also limits the board lengths to about 8', which is totally workable with both 16" + 24" framing modules that you'll be fastening the decking to. I've used Western Red Cedar and Port Orford Cedar in quite a few projects and while neither material is local, I still prefer them to pressure treated. If you request FSC certified wood you can be assured you'll receive wood that was sustainably harvested. Another softwood that bears mentioning is Douglas Fir. It will typically be less expensive than Western Red, Port Orford, and the Atlantic White, but with similar characteristics. 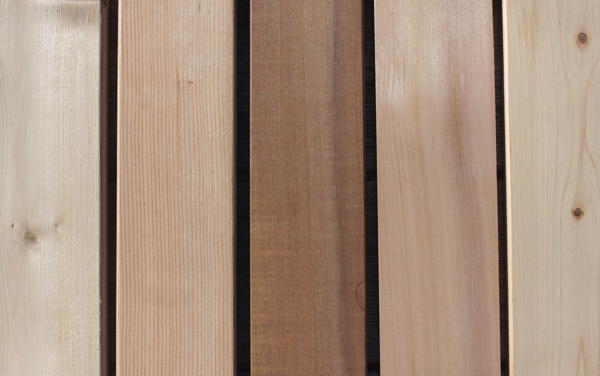 Fir doesn't have the same rot resistance as the cedars, but it looks great and if you're able to finish it with a penetrating oil sealer it will last. It has the added benefit of being slightly harder than redwood and cedar. Use this if you've used fir in other areas of your project, it can help tie things together. These woods are even more durable and rot resistant than the Cedars + Redwoods. However, they have two downsides that I would consider fairly substantial. First, harvesting practices of tropical hardwoods are extremely variable and, because they often come from developing nations, are often environmentally devastating. The embodied energy of these materials is subsequently very high, traveling from rainforest by truck > rail > port > port > rail > truck > lumberyard, not to mention the carbon sink you remove from clearing rainforest. Secondly, because the materials are so dense they're difficult to work with, they dull tools and require pre-drilling of holes prior to fastening. There are too may species to mention by name, but you've probably heard of some of the most popular, Mahogany, Teak, and the very popular Ipe (say: ee-pay) or Ironwood. True to its name Ipe is solid, strong and looks beautiful. It weathers to a soft gray and can be brought back to its original color by lightly power-washing. Again, I've used this material on projects (Pond House above) and can attest to its durability, strength and beauty, but it comes at a cost...both environmental and financial. Request FSC certified if your conscience suggests it and while you'll pay more for the chain of custody certification you'll know while sipping your G&T on your deck that you didn't clear cut a developing nation to make it possible. Most decking I use is 5/4x6 (the actual dimensions are 1"x5 1/2", as they surface the boards removing 1/4" of total thickness and 1/2" of width). Not all projects call for this size, but generally wider boards=lower labor costs to install and fewer fasteners. Each material can be sourced in differing widths or even set on their sides down to about 2" in width. With the softwoods you won't want to go less than 5/4 thickness as the material can feel spongy underfoot...remember it's a softwood. The 4" wide boards can look very boat-like and tailored sI have a soft spot for that look. I prefer stainless steel screws. They hold well, they don't require pre drilling (on most woods), they allow you to pull boards for replacement at any time and I think they look great. Choose your head pattern...personally, I prefer the square drive but many contractors don't like how easy the screws can strip. Star drive heads don't look as nice but they install quite easily and the added torque resistance keeps them from stripping. Many of the tropical hardwoods will require pre drilling with a countersink bit to keep the head below the surface level. Some contractors swear by ring shank stainless steel nails...those work too, good holding power, but around softwoods think about flying hammers and dented wood. Not my favorite...and the drive depth can vary which can mean you're feeling the nail heads under foot. Don't. Seriously, let the wood weather naturally...you have other things to maintain don't you? Choose a wood that silvers and resists rot and decay and you'll be able to relax and enjoy your deck rather than washing, sanding, and sealing. If you like tedious work or want to preserve the color of your new wood, choose a penetrating oil rather than a film forming protective coating. Penetrating oils mimic the natural oils in products like cedar and help keep it from warping and cracking while letting the wood breathe and dry after wetting. Beware, this is an ongoing chore and if you neglect it you'll work even harder to get the new wood look back. Esthetically, if you care at all how your deck looks or you want to brag about what good taste you have...please don't use plastic decking. I always argue for the natural over the synthetic and this is a case where some of the materials in these products (like PVC) are harmful to people and the environment. They may outlast you and require very little maintenance, but in my opinion they're truly a strange beast. They imitate everything about the natural product you'll wish you'd bought, wood graining, coloration, and size. Save the plastic for your drain pipes. Do you have a favorite material I've left out? I'd love to hear from you...meanwhile, I'm planning to post a price comparison for some of the products I specify regularly.